I've been starting to work (slowly) through my TBR pile. This summer will be the season I conquer it -- hahaha. Yeah. 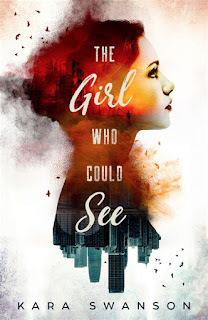 Anyway, The Girl Who Could See was the story I picked up last week. May I begin my review by gushing over the cover? Absolute gorgeousness and so cool. TGWCS starts out with our heroine, Fern Johnson, being interrogated by an FBI agent. A skyscraper collapsed...a disaster she warned them of two weeks ago. This tense scene was a great way to get my attention at the start of this tale. Fern received the information from her imaginary friend, Tristan, a young man who came into her life after a trauma when she was eight. But she's not little anymore -- and she still sees him (and hears him) every time she turns around. She can also see a scary world that often superimposes itself over the typical sunny, L.A. landscape. It's a wasteland -- sandy, dry, devoid of life. Hallucinations also interfere, dangerous situations that make her question her sanity. Psychiatrists have encouraged her to ignore the visions and her friend, but her "ability" caused her to fail high school. Now, it's compromising her job and threatens her current situation of caring for her niece. Tristan tells her that his world, the sand-covered one she sometimes sees, is dead. A dark evil, The Rhoon, has decimated it. It's now working on escaping through a rift between the worlds to begin on hers. I loved the hero and the heroine and the chemistry between them. About halfway through the story, Fern's feelings for him change, and I believe that truly made the difference in the story's ending. It was a straightforward tale -- something bad is going to happen and they must overcome Fern's stubbornness, other characters' unbelief, and a few physical obstacles to prevent a disaster. But near the end, the author threw in a twist that prevented the story from dragging and also answered the questions surrounding the trauma that occurred when the heroine was young. TGWCS is a novella, and the shorter length made me wish for more story so some of my questions could be answered. I wanted more of Fern's backstory, more scenes with her niece and how that arrangement occurred, and more interaction between Tristan and Fern. I pretty much just wanted more -- everything. What can I say? I get greedy with good stories. It read like a prequel, and I'd read another book about the characters in this story world. I give The Girl Who Could See four-and-a-half heartfelt swoons out of five. Ooh, I can't wait to read this story! Thanks for the review, Jill! This one has been on my TBR for awhile and your review makes me want to read it even more! Thanks, Jill!